This coming Monday is Labor Day here in the US and I am so ready for a mini vacation to celebrate my birthday and also our 14th wedding anniversary. It still feels like we just met and have so much in common. Often the same thought still comes to us at the same time. 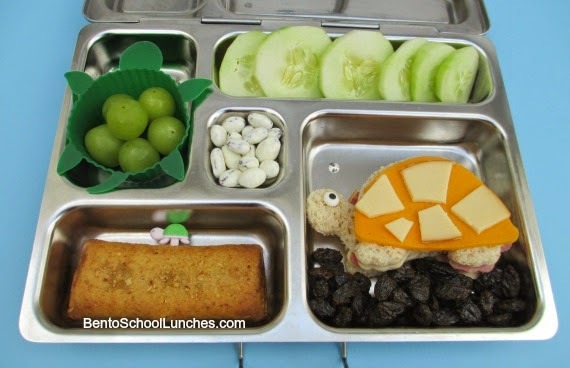 Nikolai is quite interested in turtles lately, so I think he will really enjoy this turtle themed bento lunch and it was great fun to make. Have a great weekend everyone! Upper left - Seedless green grapes in a turtle shaped silicone cup. Upper right - Cucumber slices. So adorable, I love the turtle! This is so cute! Happy birthday in advance and enjoy the long weekend!